We start this week with reassuring news for anyone scared about heading to a special place in hellbecause they haven’t got a Brexit plan – you won’t be lonely. No one else has one either. To increase the positivity we want to clarify that there’s a special place in RF heaven for any of you that don’t have a plan for this weekend – because it’s you we’re here to help, with this week’s selection that roams from deactivating facebook to taxing its founder, and back to Brexit. $100 Facebook. Facebook turned 15 this week, and like all stroppy teenagers its birthday was a good excuse for a row. Not about whether it could stay out late, but how much we value the free service and what it’s doing to our collective wellbeing. New research asked Facebook users how much they would need to be paid to deactivate their account – around $100 a month was the answer, indicating quite a large welfare benefit to users from the free platform in terms of instant access to both news and reasons to be jealous of our friends’ holidays. But, because nothing is simple in life, the results also found evidence of genuine wellbeing improvements for users who DID deactivate Facebook. It’s almost like us humans are prepared to spend money on things that are bad for us…. who knew. Founding females. Not great news on the gender gap in British business this week. A new, government commissioned, study into obstacles female-run firms encounter accessing venture capital showed that less than 1p in every £1 of venture capital goes to firms run by women alone. And before you think this is good news about lots of gender balanced founding teams, 83 per cent of the cash is going to teams including exactly zero women. Chief Secretary to the Treasury Liz Truss touched on the report at an RF event earlier this week, when she wasn’t tearing into the nanny state for having a view on the correct size of a pizza – check out the video. Japan leads the world. Twenty years ago this month Japan looked like an extreme economics experiment, taking interest rates to zero and then later introducing something even more extreme – quantitative easing. This long(ish) read gives you the Japanese backstory to polices that seemed extreme at the time but that the financial crisis turned into the bread and butter of macro-economic policy making. Worth a read. This was the week that the Bank of England went very gloomy on the short term future of the British economy, downgrading their growth forecast to 1.2 per cent this year. If that happens it would be the slowest growth since the financial bit of this whole decade long crisis back in 2009. Now clearly making forecasts right now is a mug’s game (which future are we forecasting? 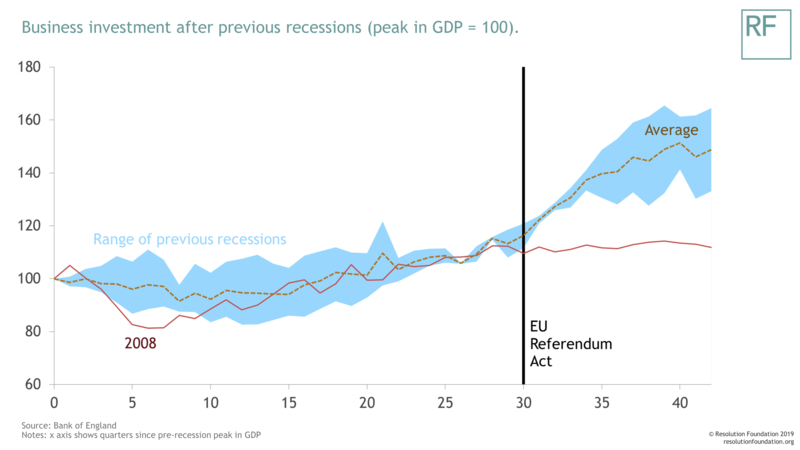 ), and hopefully the Bank are wrong (in the right direction) – but whatever you think of the forecast there was also lots of hard data in the Bank’s report this week, including today’s Chart of the Week. It shows painfully well the flat lining of investment recently – and to rub it in shows that after previous recessions we’ve been well and truly into the next investment boom by now. On Monday we’ll be looking into what this all means for household incomes. And If you want to hear more from the Bank on the state of the economy we’re hosting a major speech by MPC member Jan Vlieghe on Thursday.